Computer aided Virtual Reality has been around since the late 1960s and its debut was less than promising. In 1968, Ivan Sutherland and Bob Sproull created the first head-mounted device (HMD) that a person could wear in order to be fully immersed in a virtual environment. Their HMD and its associated software did have a few problems. The HMD was so heavy it needed to be suspended from the ceiling and the viewer needed to position themselves inside of it, the graphics were nothing more than wire-frame renditions and the environment – while virtual – was hardly immersive. Overall, the device was so formidable and imposing it was given the name The Sword of Damocles. Since then, however, things have certainly changed a lot. Within the past year several companies have created VR headsets that weigh a fraction of Sutherland and Sproull’s invention and with software, the two men simply could not have imagined. While Virtual Reality still hasn’t exactly gone mainstream, it is about to enter the fast lane of automotive sales. VR assisted sales options have not been seriously considered until now. But with the improvement of graphic displays, software sophistication and computing power, immersive environments are truly a modern day reality. Today’s options for VR experiences means auto sales showrooms can now offer a wider range of cars and options that will benefit dealers and customers alike. 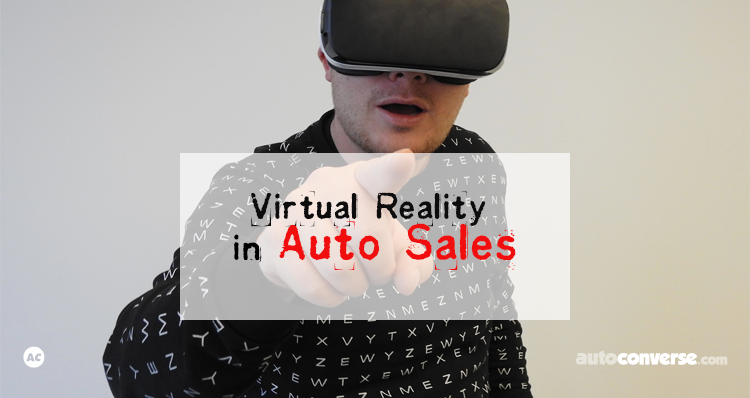 Perhaps the most obvious application for VR in auto sales is the virtual test drive. Being able to give customers the chance to take a car for a spin without leaving the showroom is one of the big dreams for many dealers. If customers have quality VR hardware of their own at home, these virtual test drives could even be downloaded at home. Customers could essentially go through the options online and then have a test drive before they ever set foot in a showroom. With the right software and internet connection, there’s even talk about having customers conduct the entire buying process – including the digital signing of documents – all in a VR environment. People could browse for, test drive and ultimately buy their next car without leaving home and simply arrange to have it delivered the following day. Heck, if Amazon Prime Now gets involved, dealers could team up with freelancers to deliver within hours of signing the contract. The options for VR integration don’t stop there, however. Auto manufacturers and after-market specialists have pointed out there’s plenty of room for opportunity when it comes to building or customizing a car. Auto enthusiasts could build their dream car from the ground up and have it manufactured or updated by anyone in the world. This could take current options dealers offer for website visitors to ‘build your own car’ to a whole new level. While people have been searching for ways to develop a truly immersive environment, only recently has computing power been up to scratch. The future of Virtual Reality in mainstream society is brighter than it has ever been before. With benefits to manufacturers, dealers and customers, we are likely to see the auto industry embrace VR technology and help make it a part of our daily lives.